The municipality of Itatiba lies to the northwest of the state capital, Sao Paulo. The city is already served by a private member golf club at Quinta da Baroneza but another restricted golf facility debuted in 2015 which, if anything, is even more exclusive. Several years in the making, the course at Santapazienza Golf Club was built on a property owned by a developer, who called in Tom Fazio and his son Logan to design their first South American layout within an enormous, densely forested estate. The Fazios certainly pulled out all the stops to make this layout as visually pleasing as possible. For instance, standing on the 217-yard 3rd tee, your eye is drawn to the stream that spills over little waterfalls to the right of the putting surface, before it empties into the lake that fronts the green. After putting out at the par four 5th, the cart path to the next tee heads straight towards a lake – which seems at first like a disaster waiting to happen – but a sturdy causeway continues just below the surface, giving other golfers the impression that you’re driving on water! This is just one of example of the extraordinary lengths the Fazios and the owner have taken to hide Santapazienza's cart paths. On the back nine, the 212-yard 12th is probably the most memorable par three on the card. Here, the tee shot drops almost 100 feet from the teebox, across a ravine to a split level raised green that tapers to the left, with a front bunker adding further protection on that side of the hole. The round at Santapazienza ends with a strong downhill par four, where the tree-lined fairway plunges to the right off the tee. A lake also threatens on the right and an enormous bunker guards the left of the hole so be sure to aim straight and true to avoid both sand and water at the home hole. Up until now I’d have to admit that when I thought about Brazil, let alone South America, the last thing that came to my mind would be golf. However, as with most ideas in time they grow and change. Little did I know that one of my greatest golf experiences would come from this beautiful country known for football, carnival, the Amazon and samba. Santapazienza may well be the golf adventure of a lifetime. It all starts with an hour long ride through the rolling hills of the Brazillian countryside from the hustle and bustle of down town Saõ Paulo. Arriving at the entrance the iconic gate is the first thing to welcome you. An interesting story; the gate was purchased by a young man on a whim with the hopes of someday being able to find a fitting place for it. Rightly so it now serves as the club logo. Once at the clubhouse you really start to understand what level of love and passion has gone into this amazing place. One might expect pure decadence, as can be found in many wealthy clubs around the world, however, quite the opposite is true. This clubhouse feels more like walking into someone’s home, everything revolving around golf and every piece collected over the years. The Golf Channel playing on the TV (of course) and various elegant and cozy sitting areas, including a square shaped bar similar to what one might find in a relaxing environment at a beach resort. The climate allows the walls to be open unveiling a view of the first hole and other parts of the front 9. The atmosphere is that of the most relaxing and mesmerizing silence and tranquility you can experience. Like no other golf course Santapazienza has been built to coincide and in many ways safeguard the wild life within the property. For example, there are no signs of cart paths. These have been worked away out of the view of the golfer completely in a fashion never seen before on a golf course. Starting with what are being called “Jesus bridges” on the front 9. 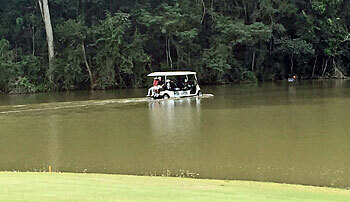 This brilliant idea links holes together by running the cart paths under water, just enough to allow them to remain out of view and give the carts the impression they are driving on top of the water. When not driving on water the carts are taken through elaborate tunnels built under the landscape and hidden away from view. Cart paths that bridge the gap between the 12th and 13th holes and the 13th and 14th holes highlight the back 9. These gaps take the golfer straight into the rain forest. In what feels like a Disneyland ride the carts drive across wooden elevated bridges built to coincide with the nature by being raised to a point that all the animals and wildlife can easily make their way under. The feeling is as though nature was completely untouched by the cart paths. The golf course itself is in every way a masterpiece and from the beginning it’s clear to see that it’s been a labor of love and passion every step of the way. Most courses are built with restraints ranging from political to environmental to those placed on the architects from developers and owners. Santapazienza may well be one of the only, if not the only, purely blank canvas that has been given on such an amazing site. The benefactors of this gift were none other than Tom and Logan Fazio. Having fallen in love with the place and the people involved they spent more than 5 years building what they believe to be their holy grail of golf. From my perspective it would be hard to argue against that even with great courses like Wade Hampton and Shadow Creek lining the family resume. The Fazio’s are known for moving a lot of dirt in order to make courses fit perfectly into their own view and in most cases for designing courses that reside in real estate developments. That is not the case at Santapazienza where a father and son, the Malzoni family have realized this dream. It is not a club that will ever have members, there are no houses being sold here. It’s their back yard and their getaway from the hustle, bustle and stress of daily life and one of the largest cities in the world. In that sense it cannot really be called a golf club but perhaps better a private golf course. The front 9 at Santapazienza has a considerable amount of water with lakes running through the property. Starting with a beautiful medium length par 4 with a slight dogleg left. A solid drive up the right side affords the golfer with a short iron approach to tricky raised green protected by a huge bunker on the front right side. The second hole is an early and stern test, a long par 4 requiring a solid drive and a long iron to hybrid for the approach. Number 3 is the first hole that flirts with the lake, an idealistic one shotter requiring a carry over the lake to a green with a waterfall and stream running on the right side. Interestingly enough for the weaker golfer there is a safe route to the right that allows the possibility to play the hole avoiding most of the water. The Fazio’s followed a couple of well thought out principles at this course. One was that they wanted the golfer to see the entire hole from the tee box. The other which is quite unique in my experience is that they built the course with 4 sets of tees from various lengths allowing the differing levels of golfers very different views and essentially different holes to play. The pro level back tees take on significant carries and offer constant and direct confrontation with the courses hazards. Other tees completely change the view and playing angles allowing for slightly more realistic challenges for each level. The 4th hole is a downhill par 5. This one is reachable with two excellent shots. The green is smaller than most here and heavily undulated. Number 5 is the first short risk reward par 3. A drivable hole for longer hitters who are willing to take on the 260+ yd carry to the green. The safer route requires a choice of various options played to the left of and around the water to a small green that rewards a tee shot hit as close to the water as possible. After the 5th hole the golfer can take a quick pit stop at a cute little hut for some fresh coconut milk, fruit or other snacks. This hopefully prepares them mentally for the challenging 6th hole. This slight dogleg left has a lake all the way down the left hand side, bunkers guard the right making for the most daunting tee shot on the front 9. A strong drive allows a very testing approach with a mid to short iron to a green protected by water left and a strategically placed bunker. The reachable par 5, 7th runs uphill to a small elevated green. The tee shot is quite a test if you want to attempt going at it in two. Large bunkers flank the fairway on either side but the hole allows safety in a shorter tee shot that would render this a 3 shotter. The 8th hole is a par 4 running back down toward the lake and clubhouse. An exacting tee shot will leave an exacting approach to one of the most undulated and smallest greens on the course. The 9th hole, a mid length par 3 playing uphill, is flanked down the right side by a waterfall and stream. Another beautiful hole that brings you back to the clubhouse to finish the front nine. The back 9 starts off along the lake before climbing up through the rainforest into the mountains. The par 4 10th is one of the tougher holes on the course. The tee shot has cape hole characteristics and the closer you play to the water the better your angle of approach. The fairway is deceptively massive with tons of space for safe play but this will significantly increase the length of the approach which is long even with a solid drive. Then green is accepting of a long approach even allowing for a run up. This may well be the largest green up till this point on the course. At this point it’s well worth noting that Santapazienza is one of the best maintained courses I’ve ever seen. It would not be an unfair comparison to suggest it has Augusta like maintenance in terms of the level of perfection. The greens are literally perfect and among the best maintained I’ve ever played. Undulations are perfect and not overdone. The owners have done several things here that I highly commend and would consider refreshing compared to many similar stories. First of all they let the architects do their work to create this masterpiece. Secondly they made sure to not cut any corners in terms of the build up, drainage, bunker and green creation. It’s all been built for the future with sustainability in mind, for example bunkers requiring minimum maintenance and being able to withstand copious amount of rainfall in short periods of time without washing out. The second night of my stay it rained in biblical proportions (35 mm), I was certain that no golf would be possible for the next days, even taking the most positive outlooks. The rain stopped at 8 am and by 10 am the course was dry. I wouldn’t have believed it had I not seen it with my own eyes. Moving back to the course tour, the par 4 11th hole works its way up the mountain towards the rainforest. At this point the routing has the first significant challenge in the form of the need to work its way up the mountain to the 12th hole. This was a really tough section to route the course through and while the course is certainly walkable this amazing walk through the rainforest is very hard work for even the fittest golfer. Compare the climb to that of the one between the 13th and 14th at Bandon Trails. If a large event was ever held here they would most likely shuttle people up between the 11th and 12th and on to the 13th hole. The wonderful but tough walk is rewarded with one of the most spectacular drop shot par 3 holes on the planet. Once you catch your breath you realize your knees are shaking while you try to pull of this awesome 190 yd shot to a long thin green moving right to left away from the line of play and protected by a massive bunker middle left. Having successfully manoeuvred the 12th the golfer ventures back into the rain forest for yet one more climb. The par 4 13th awaits and what a spectacular hole it is. The back 9 really is spectacular offering up one breathtaking tee shot after another. The tee shot requires a solid drive and a choice from a two-tiered fairway. The high side is slightly longer but affords a better view of the green. The low side may allow for a shorter approach but requires you to take on one of the largest fairway bunkers you may ever see. It also requires a tricky semi-blind approach over a huge green side bunker left of middle. The par 5, 14th offers up an amazing view from the tee, don’t forget to look back out over the valley. It’s highlighted by a tricky drive with another incredible bunker (in terms of scale and size) on the right side. Longer hitters can take on the bunker to receive a huge extra kick down the hill behind it. This can allow for a chance to reach the green in two. For the rest of us the second shot requires very exacting placement in-between bunkers and over a small valley. The best angle of approach requires taking on the fairway bunker on the left side. Play right for more space and what feels like a safer second shot but be careful as the fairway falls away to the right side. The 15th brings us to the highest point on the course and provides the most spectacular view of the valley below with a river running right to left down the valley. The tee shot on this par 5 has a massive elevation drop and gives the feeling you can hit the longest drive of your life. Another incredible bunker flanks the right side of the fairway and requires a shot of about 350 yds to carry. If successful it may be possible to reach this green in two. Most likely the player is faced with a downhill second shot that requires careful placement based on the pin position. Right must be avoided as the fairway drops off to the river. The green is protected by a large front bunker that can be avoided right and left. The par3 16th is the final spectacular par 3 on the course with one of the biggest greens which is a severe two-tiered green that has a reverse Redan aspect to it. The green plays around a giant bunker and requires a solid carry to reach. The high side and front of the green then drops steeply and moves from left to the large lower tier on the right. It’s a great 3 offering up many options from the tee, especially for middle and back pin positions. The 17th is an awesome par 4 and perhaps my favorite on the course. Again what immediately hits you on the tee is the huge scale of the bunkers and some natural massive rocks scattered around. This hole plays up hill and requires a solid drive and an equally strong approach to reach in two. The green works its way up and around the large green side bunker. The back right pin position is extremely tough to get at. Finally, the par 4, 18th offers yet another spectacular view of this dogleg right drop shot hole. As this hole is short the tee shot makes you decide between a variety of options starting with going for the green. Other options would be to take on the lake and right side fairway bunker to afford a short iron approach. It’s also possible to hit an iron and a mid-iron into the green. Taking on the fairway bunker and lake requires an exacting shot as another huge and wonderfully shaped bunker flanks the left side of the fairway. The final approach into this two-tiered green that wraps around a middle greenside bunker is very tricky and the pin position should certainly determine the tee shot. The lake surrounds the low side. Santapazienza is a truly wonderful golf course and on top of that as an experience one of the best I have ever had. It is a true labor of love not only from the Fazio’s but also from the family that owns it, the realization of a long-term dream that will only get better over time as the facilities expand with the moving of the entry road to allow for ideal usage of the other portion of the property. Length – 6.724 Course Rating – 72,7 Slope Rating - 135 Walkability – Hard What golfer has never dreamt about building a golf course where he could invite friends to share his passion for the game? In my dreams I would build a links style course with fescue defending the fairways and tricky greens. Santapazienza is the result of a similar dream combined with a good piece of land and a great architect. What started with a course good enough for most mortals took epic proportions with the arrival on the scene of the legendary architect Tom Fazio. Santapazienza starts flat with beautiful lakes contouring large fairways and undulated greens. That suddenly changes when the course moves to the top of the mountains via a wood bridge carved in the middle of a small jungle. In my opinion, one of the hardest things in golf is to combine holes with very different patterns without losing the rhythm and consistency. In this case, it is fair to say that Mr. Fazio not only succeeded in the task but also created a course that grows in intensity culminating in the heroic last hole where an accurate driver is the difference between an easy birdie and a double bogey. It is easy to say that this is a masterpiece, not because it doesn´t have one weak hole but more importantly because it doesn´t have a signature hole, there are at least five suspects fighting for that honor. So let me try to describe my favorites. The second hole is a majestic 440 yards par four that will require two good shots to reach the green. For me this is a great way to start a round, it will warm you up, stretch your muscles and help to keep your blood pumping. The first par three has a forced carry over a lake and a cascading stream defending the right side of the green. It´s hard to believe that this is the second prettiest par three on the front. The seventh is a par five reachable in two with a 45 yards green protected by huge bunkers. Big greens and huge bunkers are the norm in the first nine and they get even bigger on the second half. The most dramatic par three is number 12. You play from an elevated tee through a valley covered with trees, you will be lucky if the flag is not positioned on the left side of the green where a small plateau guarded by another huge bunker can make this hole a true test of golf. Now that you are in the top of the mountains enjoy the view and relax because you will need your energy for the longest par five on the course number 15. Even with a tee box 50 yards higher than the fairway this 657 yards hole, with OB on the left and water on the right, will require three good shots to reach the green. If you are able to do that don’t relax because this is not an easy green. Number 16 is one of the most intelligent par 3s that I ever played, with an extremely large and down sloping green this par 3 will play easier if the pin is in the back. With the pin in front you will need to control your distance or you can end up with a 150 feet up hill put. To be honest, in this situation a 3 putts bogey would be excellent. The heroic finishing hole is not one of my favorites but it is impossible not to mention it. Playing over a 50 yards downhill this par 4 is protected by a lake on the right and an immense and intimidating bunker on the left, the green wraps around a front center bunker and the right side of the green is perched above the pond. This will be a finishing hole you surely won´t forget. Santapazienza is one of those courses that keeps you dreaming about playing again and again.